TK: Did you ever see a ghost? LK: No but they moved all the bathroom doors and wardrobes open and everything. LK: I went to see my friend he lives in Woburn Abbey in England (was a house to priests or monks or something) for the weekend. I left after one day, I couldn’t do it, it freaked me out. (stuttering) It’s a house a family owned, it was an abbey, now it’s a public inn; not sure what it is to see all the stuff. It is known to be haunted. My mom’s friend grew up there and always saw ghosts growing up as a child. Mind you, he only told my mom this much later. LK: Robin, aka Lord Russell. We went for dinner and spent the night. Robin was in his room, I was in my room and who else went with us? I don’t know, a couple other friends? Robin told us stories about when he was a kid when he grew up it was haunted. TK: Were you in the room alone? LK: Yeah, everyone was ALL THE WAY DOWN THE HALL. So I was watching television and the TV kept popping in and out like a switch (acting it out) Meanwhile his mom came in to give me a pill to calm me down because I couldn’t handle it. I guess I finally fell asleep with the TV on and woke up to find every single wardrobe door open and the bathroom door was shut and the door to the bedroom was locked. LK: I freaked out a little bit. I got up, I closed the wardrobe drawers, went to the bathroom and unlocked the bedroom door (laughing, thinking, nodding head) um…all the stuff in the bathroom and the toiletries were on the floor, toothbrush, toothpaste, everything that I had used to shower and everything. LK: Picked everything up. I would say that was about three in the morning-ish. I opened the bedroom door to see the hallway, you know, I was freaked out. TK: How did you go back to sleep after that? LK: I sort of laid there. I thought Robin was playing a trick on me, you know, so I actually walked down the hall, now that I think about it and walked all the way down the hall to see if they were up and didn’t really know which room they were in for sure and decided not to go all the way (shaking head) I didn’t want to see anything I was petrified. So I went back to my room put the TV on and I guess eventually fell asleep again and that was it. I woke up in the morning. TK: What happened in the morning? LK: I asked them if they had played a joke on me and they said no, oh come on, laughing, they go not at all. It was freaky. We were having breakfast and I said that’s it we’re not staying here anymore and his parents were laughing. TK: Who were you with? LK: His parents live at the house and his younger brother and I went there with Robin. And that was it. THE INFORMANT: The informant was my mom. She was family friends with the Russells who were occupying the estate, and this occurred in the late 80s. This was the only time she experienced a ghostly visitation and the way she describes it makes it clear that she was disturbed by the incident although the family did not take it very seriously, possibly because they had dealt with the ghost before. ANALYSIS: Woburn Abbey has long been known as a place haunted by ghosts and spirits, much like other English estates with a long history and many previous occupants. According to the website Ghostly Rooms, which catalogues ghost sightings in homes, “It is also said…there is a spirit that haunts the private chambers of Woburn Abbey. This spirit manifests itself by walking through the lounge, without being seen. The door will open on one side and the sound of footsteps move across the floor as the spirit passes through. Once on the other side the other door would open and then slams shut as the spirit leaves. In the 1960s this ghostly activity became so frequent that the Ducal family had to move their television to another room so the could watch the television without the chance of being disturbed.” This seems eerily similar to the experience my mother had, in which she was in one of the private chambers and noticed doors opening without explanation as well as a disturbance of her possessions. Informant discusses a personal experience she had in Arizona over a decade ago. SP: I was maybe ten at this point– I think it was probably ten or eleven, and I remember the first thing that freaked me out was my dog growling like crazy at nothing we could see. We were driving from Santa Fe and we crossed the border into Arizona and there’s this mountain chain there called the White Mountains. Super pretty, green, all that. Anyway, we had our dog with us, he was a terrier so pretty small and generally pretty chill, but he started doing this low growl and staring out the window. Almost like he wanted to launch himself out at something. TK: So what did you see? I remember you telling me about this a while back. An animal, right? SP: I looked out and there was this tall figure that looked like a mountain lion– some kind of big cat like– umm…it was standing on its hind legs, like a bear might, not natural. Maybe like fifty feet off the road in the woods. Not a bear, for sure. TK: Did you guys stop or do anything? SP: I told my parents and they figured it was some kind of illusion. I was reading a book in the backseat like usual and I guess they thought it was my imagination. But I remember being freaked out and the dog wouldn’t stop growling until like five miles later. THE INFORMANT: The informant is a mid-twenties female who grew up traveling with her family frequently and was always interested in myths and legends at a young age, specifically in cryptids (unproven or mythical animals) due to a childhood fascination with shape-shifting animals. She has never seen anything like this since but has heard similar stories of large animals walking on their hind legs in mountainous or rural regions, often chasing or looking at cars. ANALYSIS: There seems to be a cultural emphasis on shape-shifters that is especially prevalent around communities of Native American tribes, who call them skinwalkers and usually choose not to talk about them at all due to the belief that discussing a thing will give it power and/or summon it (also seen in the Christian idea of summoning demons and, pop-culturally, in the Harry Potter universe as a protective spell against Voldemort– “he who must not be named.”) The skinwalker is often described as an evil person who got too involved in black magic and lost his or her human form, becoming more of a spirit and sometimes known to shift shape (mostly into animal forms) and often chase cars. Skinwalkers usually are described as being larger than average size, if they do appear as an animal they have eerily human mannerisms such as walking on their hind legs, and those who encounter them often report a true feeling of dread. The informant does not know much about this tradition and cannot say for certain much more about the appearance of the creature. ANALYSIS: Magpies have frequently been considered a bad omen in many cultures, specifically Britain as far back as the early sixteenth century. As the rhyme shows, most of the numbers have good things associated with them; the only bad magpie to see is one lone magpie. For this reason, in many parts of the United Kingdom, “people will salute a single magpie and say “Good morning Mr Magpie. How is your lady wife today?” By acknowledging the magpie in this way you are showing him proper respect in the hope that he will not pass bad fortune on to you. By referring to the magpie’s wife you are also implying that there are two magpies, which bring joy rather than sorrow according to the popular rhyme.” The fact that this superstition has lasted so long reminds us that, especially in places with such ancient culture as the UK, old superstitions die hard and many of our modern ways of behavior stem from them. Before leaving the house on a long journey, the entire present family must sit in silence for a period of time (which varies by family and local custom) in silence. This is often considered a useful custom because in the frenzy of preparing for a trip, this time allows for people to think carefully about whether they have forgotten to pack a useful item, but it is also considered good luck to sit with the departing family in order to protect them on their upcoming journey or, if they die during the trip, to attain closure so that one does not retroactively regret not taking time with this person before they leave. THE INFORMANT: Mid-twenties woman who has studied Russian and Georgian culture for many years, despite not having grown up in either cultural group. She currently works in diplomacy and is researching Russian Jewish superstitions for an unrelated project and out of intellectual curiosity. She says this is also put into practice in Georgian communities in which she has lived and it is mostly considered a time of meditation and respect for the traveler putting themselves in the risky situation of long travel. ANALYSIS: Due to the anxiety that the prospect of a long trip can often induce, it is unsurprising that so many superstitions have developed as pre-travel rituals. Furthermore, the focus on familial relationships that pervades Jewish culture, as well as the many folktales and superstitions from Russian culture, have combined here to create a more or less secular experience that is still retained in many families (both in Russia/Eastern Europe and in immigrant homes) as a way to protect the departing travelers. Many cultures have similar customs, such as the Christian blessing or prayer to be said before a journey, asking for protection. In the Catholic tradition, this idea of protection is translated into a physical emblem, as the St. Christopher medal is used to protect weary travelers from potential harm. TK: Liwonde? I just googled it. PP: That sounds right. It was this big tree with human skulls, skeletons in a kind of pit at the base of the roots, and we would have to look at them. If I remember right it was because one of the tribes that was living in the area had an outbreak of leprosy and they would put them in the tree, tie them up and make them stay there until they died. PP: Honestly I think it was pretty recent, definitely in the last century. Maybe the 1930s? The worst part was they had a justification for doing it, they didn’t have the medicine or healthcare available to treat the disease and it was very contagious, so it was like this horrible quarantine where they said they were protecting the healthy people. It was for the sake of everyone else. But it was still a terrible thing to do. THE INFORMANT: The informant is a woman who lives in America now, although she grew up in Africa and Ireland. While growing up in Africa with her family in the 1960s, because her father was a missionary doctor, they were often exposed to subpar living conditions, local legends and true stories like the one about the Leper Tree. ANALYSIS: The Leper Tree is a very real place, not a legend, but has become part of the folklore of the country due to the gruesome nature of its existence. Visitors to the park who come for the wildlife and beautiful natural settings are often brought to the tree and asked to look down upon the skeletons of those who were trapped in it as recently as the 1950s. It is commemorated by a plaque on the trunk that says simply, “The Grave For People Who Suffered From Leprosy in the Past.” Burial and the proper disposal of bodies has always been a cultural hallmark– many cultures develop incredibly specific rituals around burial rites, which makes things like the Leper Tree stand out and be recalled even now for how barbaric and unrelated to traditional notions of respect for the dead it is. Mothman is a cryptid (animal or plant whose existence has been suggested but has never been documented convincingly by the scientific community). The Mothman legend consists of several sightings of a creature in Point Pleasant, West Virginia, during the period of November 15, 1966 to December 15, 1967. The creature was described as being as tall as a man, but with bird-like ten-foot wings and eyes that glowed like “bicycle reflectors,” and multiple people saw it and even claimed it was following their cars or flying over the forest. The sightings of Mothman stopped after the Silver Bridge disaster, in which the aforementioned bridge collapsed on December 15, 1967 during rush hour traffic, resulting in the deaths of 46 people. Because sightings stopped after this point, it has been suggested that the Mothman frenzy had something to do with the bridge collapse. INFORMANT: Many of the people who reported seeing the Mothman have been kept anonymous and are perhaps apocryphal, like the sources of many urban legends. However, some people did report it to the police, including Mr. and Mrs. Roger Scarberry and Mr. and Mrs. Steve Mallette, whose sighting is perhaps the most well-known. They were driving near the “TNT Area,” known for its historical usage as a place where munitions and explosives were built and stored in bunkers during WWII. They reported sighting to the police, as did others in the vicinity who claimed to see the cryptid over the coming year, but nothing came of it; the police were never able to view it themselves, nor was anyone ever able to convincingly document a sighting. ANALYSIS: The Mothman legend is one of the more famous urban legends, having even been turned into a book and subsequent movie called The Mothman Prophecies. Noted folklorist Jan Harold Brunvand notes that “recountings of the 1966-67 Mothman reports usually state that at least 100 people saw Mothman with many more “afraid to report their sightings” but observed that written sources for such stories consisted of children’s books or sensationalized or undocumented accounts that fail to quote identifiable persons.” The most likely explanation for the Mothman is that it is a sandhill crane (which could easily grow to a size larger than a man) which had wandered from its typical migration route. Also, many speculated that the collapse of the Silver Bridge was connected to the Mothman. Infrasound is a phenomenon in which “exposure to low frequency sound vibrations which we cannot detect may also have considerable impact on humans.” Among the side effects are hallucinations. People have proposed the theory that in the year leading up to its collapse, the Silver Bridge may have been emitting these low-frequency vibrations and causing town-wide hallucinations (perhaps including the Mothman), but this has never been satisfactorily proven. 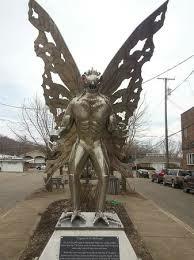 Whatever did happen in Point Pleasant, during the time period of the so-called Mothman, the town has now commemorated it with a lovely statue. Growing up my mom always told me never to put a hat on a bed because it brings bad luck. I am always very conscious if I’m wearing a hat never to place it on a bed, and I really notice it when I’m packing for a trip–I always put the hat far away from the bed. If I’m with friends and they place a hat on a bed I will always be aware of it but won’t say anything because I don’t want to impose, but it does make me nervous. My mother was passed down this superstition from her mother, who has plenty of superstitions from growing up in London. INFORMANT: My mother, via her mother. ANALYSIS: Research has provided several examples of cultures who find this superstition particularly strong, especially cowboys, boxers and actors/theatrical workers, three groups who are notorious for retaining superstitions. The origin of the prohibition of this behavior has been explained as “preventing the spread of head lice” as well as possibly originating in the 20s when gangsters hid guns under their hats on beds in hotel rooms, preventing them from being found if they were frisked, yet examples from Jamaican student essays from the 1890s show the superstition being used even back then, so it is likely to have developed far before the 1920s gangster heyday. TK: What did you learn growing up in New Mexico? Any good folk tales or proverbs? TB: My aunt used to tell us about the Lechuza. She was an old woman who could turn into an owl. I guess she was a witch. TK: What did she do? TB: I’d have to check for all of it. I remember she was supposed to have stolen babies, and would sometimes fly over your house at night. You could tell if she was around when you heard an owl. My aunt told us we were supposed to whistle at the owls and they would leave, it was like scaring her off. Except those normal sized ones were harmless, but they were like her messengers or something. The lechuza was supposed to be a lot bigger, like human sized. Sometimes people would shoot …. or try to injure the owl if they thought it might be a lechuza and then they would find a body the next morning of an old woman, but I never heard about that being for real. THE INFORMANT: Male, mid-twenties, who grew up in a second-generation Mexican family in Santa Fe, NM. He was reluctant to recall the details of the story, but grew more enthusiastic after he recalled certain elements. He also recalled that his aunt was very spiritual and would often tell stories of this type to him and his brother and sisters while they were growing up, although now he does not put much stock in them, but still finds them interesting. TK: Do you have any stories that stuck with you from when you were little? LK: Why don’t you tell the story about my dad flying in the war? TK: Why don’t you tell it? TK: What war was this? LK:World War Two (hands on head) he would fly planes, mosquito airplanes, American-made planes, to British troops in England… it was a special mission to have the top pilots that were hand picked to fly the polar route… which now most major airlines fly. Back then they had no radar, no heat, and no (shaking head) and no modern plane facilities. The seat was a jumper seat in the plane, there was no second seat for the co pilot. They flew by the stars. LK: They flew by the navigation of the stars and the weather patterns. TK: Did anything ever really happen where it threatened his life? LK: Each plane they were successful in bringing to England. Gave them how much (ugh) A thousand dollars a plane, and back in World War Two that was a lot of money, a lot of money. A lot of people didn’t make it. It’s literally flying by the seat of your pants. (Gets up for a second, moves around but then comes back). The British couldn’t build the planes themselves, because they were being bombed from every which end by the Germans, so they would bring at least 5 or 6 planes a week, or at least tried to because they needed as much as they could. (Starts crying). LK: I think he was the only surviving member… they all died. LK: In the ocean. They didn’t make it, the weather, they couldn’t see the sky anymore. At least one died a week or two, because there was always a two man mission. It was terrible. TK: Did his co-pilot make it? LK: Yes, always, because he was with him. He broke the record for the quickest flight, but for his last mission he pushed everything out of the plane because he ran out of gas, ran out of fuel, he pushed every single thing he had out of the plane so he could glide in. Oxygen tanks to the extra seat, every single thing that could be pushed out of the plane was. He barely made it, but he did and broke the record for the quickest flight. TK: How old was he when he did this? LK: He was in his 30’s, early 20’s wait yeah? I don’t know, I have to look it up. After that he did another mission, who does that? He was sick in the head. Was that feeling of feeling invincible and he did it. THE INFORMANT: The informant was my mother, who learned this story directly from her father, the pilot in question. Facts are backed up in the historical record. ANALYSIS: This is an example of a war story passed down through a family to describe the heroism of one of the family members. The extreme danger and bravery involved, as well as the context of a World War, always creates a setting for a dramatic retelling of a family legend. Further information about this case: he won the 1944 speed record for crossing in 7 hours and 9 min. Overall, he was responsible for delivering 33 planes. Incredibly, statistics show that 1 in 4 planes failed to make it. On the flight where he broke the speed record, he only had 1400 miles of fuel when it took 2200 miles to get there and had to get into the north jet stream to blow them there if they caught it. If they didn’t, they would have died.